Like a lot of musicians, I tend to wear my influences on my sleeve. I learned to play the bass by listening to and playing along with my favourite bass players. Many different players have influenced me and I am always looking out for the next bass line that “I wish I had written.” Here are a few with links so that you can hear what I mean. Enjoy! The main line in this song is relatively simple, but it is clever and how it is played is also very important. I wouldn’t call Sting an “underrated” bassist but I definitely think that his work with The Police demands more consideration by listeners. Bombastic, intelligent, spiritual, complex, dynamic. This was one of the first Yes songs that I ever heard and the one that instantly became my favourite. I just listened to this song over and over again and I was really pleased when I figured it out myself when I was about 20. Squire uses strummed chords, artificial and natural harmonics, and string skipping with a pick all in the one song. Squire continues to be one of my favourite players and one of my bigger influences, and this is probably my favourite rock bass line of all time. This was the song that finally convinced me that I needed to buy a bass and learn how to play. Simon’s trebly tone was something I had not heard before (back in 1998), and his melodic playing was something that I was drawn to. When I was younger, there were really only two Cure albums that I got into, but this album and Disintegration were both very influential. One of the more underrated bassists in modern music, Colin Greenwood has been a later influence on my playing. He is excellent at choosing which notes to play and where to play them, as well as when not to play. This song is an excellent example of that skill and it also showcases his signature melodicism (is that a word? ), which allows his bass lines to shine through yet still appropriately blend in with the rest of the song. Something I am working towards! As you probably know we have a show (our second) coming up on May 16 at 3030 in Toronto. With live music there are a lot of things to consider and take care of: booking, rehearsing, promoting, boozing, etc. But one of the most important aspects of playing live is deciding which songs you want to play and which order you want to play them. 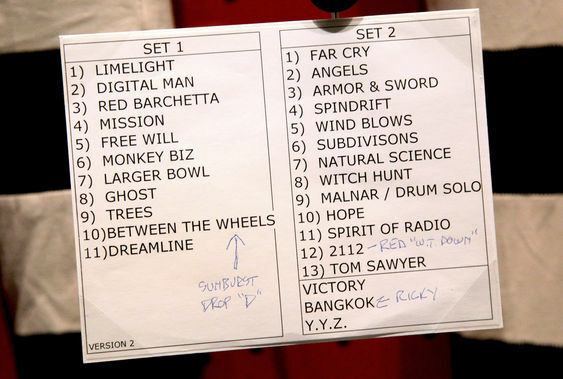 Sounds nerdy, but Tom Morello once referred to himself as a setlist “Jedi,” and with that I knew that I wasn’t the only one who thought that a great setlist was important and necessary. However, performing musicians are not the only ones who get to partake in this practice; we all make setlists these days on our iPod and other devices that help to define our party, our run, our house cleaning. Music can be a large part of our lives and it is very special to be a part of the creative side of things, working with creative and talented people who are also your friends. But whether you choose the “random” setting on your iPod or you spend hours mulling over which song to put where, music is meant to be listened to and enjoyed. With that in mind, I hope you enjoy our upcoming show, and make sure to include some Hello Companion in your next playlist!